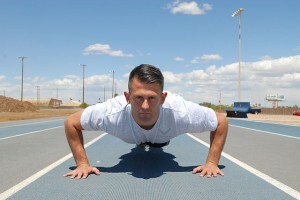 Push-ups have been around since the beginning of sport for good reason. They’re an incredibly versatile exercise! Few movements engage as many muscle groups as the push-up. A classic push-up will challenge you chest, back, arms, core, glutes and thighs. This impressive exercise can be altered to address your specific goals. For example, a recent research study found that the band resisted push-up is just as effective as the bench press at improving pectoralis major and anterior deltoid strength. Grasp an “end” of a continuous resistance band in each hand and wrap the band around the back lower part of your shoulders. Press the band in between your palms and the floor to anchor it. Extend the TRX straps t0 full length. Turn your back to the anchor point, grab a handle in each hand and extend your arms out in front of you. Place hands high enough to keep the straps from resting or rubbing against the shoulders. Step back so you are leaning forward, your feet shoulders width apart, and engage your core and glutes. Inhale and maintain body alignment as you lower the chest so that it is level with the handles. Exhale, press arms back to start position. Do you want to give your abs a serious workout while also building upper body strength? Alternating medicine ball push-ups are a fun and exciting push-up variation that will put your core to the test. Get into a good push-up position: place one hand on the ground and the other on the medicine ball. Your hands should be slightly wider than shoulders width apart, engage your core to stiffen your torso, keep your feet together and your glutes should be firm. Roll the medicine ball beneath the other hand before repeating the movement. No matter what your goal, push-ups can help you get there. Smart exercisers do not overlook this classic move because both research and decades of experience tell us that push-ups get people strong!